The LAK - 19 is a standard class sailplane designed and certified to the JAR - 22 category "U" specifications. It is a midwing glider without flaps, T - tail, retractable main landing gear with the shock absorber, pneumatic tail wheel and is capable of carrying 180ltr water ballast. 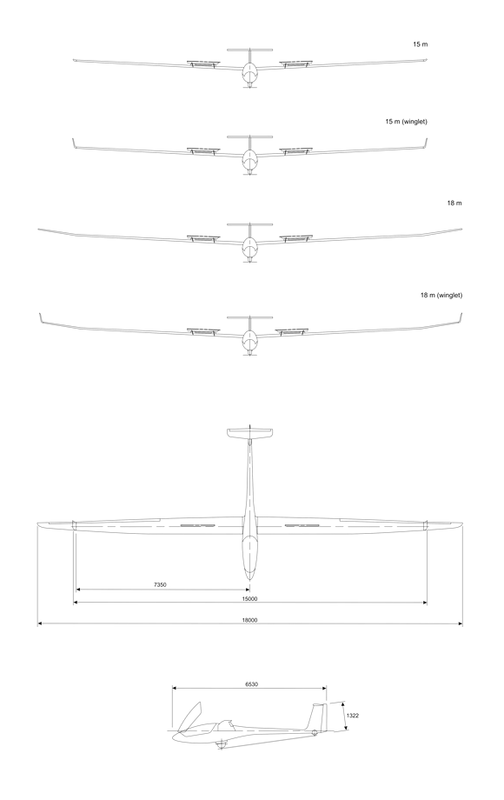 LAK-19 sailplane is made of hybrid composite materials such as kevlar, carbon, glass fibre. The wing spar is made of modern carbon rods GRAPHLITE SM315 and has a double T section. The weight of each wing panel is about 55 kg. The airbrakes are situated in upper surfaces only. The wing airfoil is LAP 92 - 130/15 and it passes into the LAP 92 - 150/15 in the tip. The retractable landing gear has a 350x15 mm tire and shock absorber. The mechanical main wheel brake is actuated by a handle on the control stick. The rudder pedals are adjustable in flight. All controls, including the water ballast system, hook up automatically. The tow release is mounted near the main landing gear and permdits winch as well as aerotow take off. The wings incorporate fork - type spar roots joined with two pins.